The journal publishes original articles about significant AI theory and applications based on the most up-to-date research in all branches and phases of engineering. Suitable topics include: analysis and evaluation; selection; configuration and design; manufacturing and assembly; and concurrent engineering. Specifically, the journal is interested in the use of AI in planning, design, analysis, simulation, qualitative reasoning, spatial reasoning and graphics, manufacturing, assembly, process planning, scheduling, numerical analysis, optimization, distributed systems, multi-agent applications, cooperation, cognitive modeling, learning and creativity. 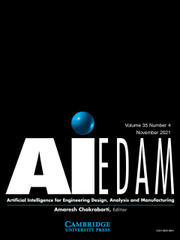 AI EDAM is also interested in original, major applications of state-of-the-art knowledge-based techniques to important engineering problems.